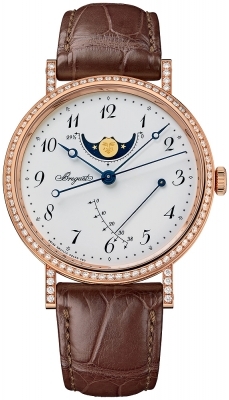 Polished 18kt rose gold case, with the iconic Breguet coined case-edge. Bezel & lugs set with 92 diamonds weighing a total of approximately 0.92 carats. Fine painted Breguet style black Arabic Numeral hour markers. 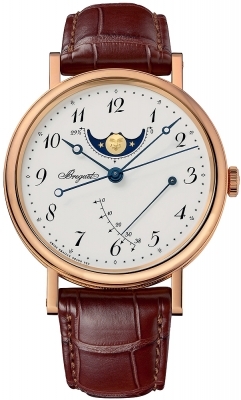 Moonphase aperture located beneath the 12 o'clock position. 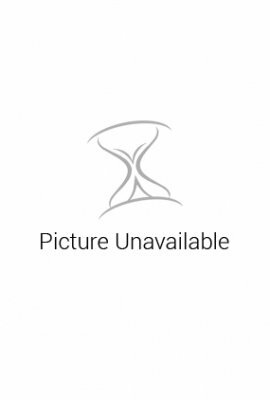 Power reserve indicator located at the bottom right corner of the dial. 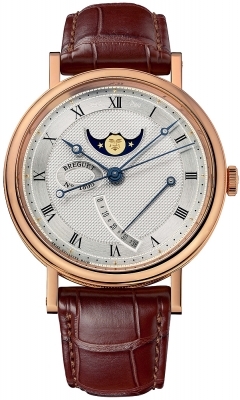 Breguet Caliber 591 DRL , beats at 28,800 vph, contains 25 Jewels & has an approximate power reserve of 38 hours.